It was an unforgettable evening for LCWA Arts & Leisure client Victory Gardens Theater whe n more than 100 top actors, directors, funders, administrators and theater critics gathered to celebrate the official naming of Victory Gardens’ new studio as the Richard Christiansen Theater, honoring the Chicago Tribune chief critic emeritus. Actors John Mahoney, Tim Kazurinsky and Tony Award-winner Deanna Dunagan, artistic directors Robert Falls, Barbara Gaines, Michael Halberstam and B.J. Jones, former Goodman Theatre artistic director Greg Mosher (currently producing "A View from the Bridge" on Broadway) and journalists Hedy Weiss, Janet Davies, Rick Kogan and Lawrence DeVine joined Christiansen’s colleagues and friends for this extraordinary event. Victory Gardens Artistic Director Dennis Zacek kicked off the program by crediting Christiansen in large part for the incredible growth of Chicago’s theater scene, as well as Victory Gardens’ continued success as Chicago’s top producer of new plays over the last 36 years. successful television writer on shows like "Nurse Jackie" and "Six Feet Under." And who knew comedian and director Harold “Ghostbusters” Ramis felt so lucky to get his start as a cub features reporter at the Chicago Daily News, with Richard Christiansen as his supportive editor and still mentor? But it was current Chicago Tribune theater critic Chris Jones who brought down the house with his tales of playing second fiddle to Christiansen when they were both reviewing plays for the paper. Still, Jones made it clear that his predecessor’s unique ability to always take in an opening night with an equally open mind continues to guide Jones’ approach to his own writing today. And that was the evening’s take away for me -- subtle reminders like listen, don’t just talk all of the time. Be receptive. Approach each new project, just like a new play, with zero preconceptions. Don’t just criticize, place equal emphasis on finding things to praise. And conduct yourself with an air of quiet pride, every day. That’s how Richard Christiansen has always comported himself. And that’s why Victory Gardens was happy to give him ‘a theater of his own.’ Click here to read Chris Jones’ account of this truly memorable evening, and here for complete information on Victory Gardens’ new Richard Christiansen Theater. 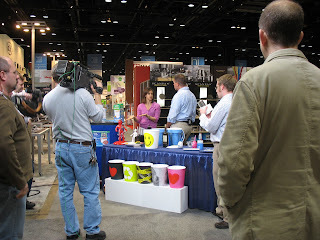 This week got off to a great start, as two LCWA clients were featured on the “Today Show” from the floor of the International Home and Housewares Show! MJSI’s HydroRight water-saving toilet converter and Eureka’s Pet Expert vacuum were both featured in this segment by contributor Lou Manfredini on the highlights of this year’s show. Congratulations to our hard-working account teams for landing a great national placement! While in Las Vegas for Surfaces and the “Go all in with Pergo” event referenced by Allison in her previous post, I had a chance to stroll the show floor. Since most of my work lies specifically in the laminate flooring category, I kept my eyes peeled for the newest trends that editors and consumers alike will be talking about this year. Art Deco Style: This style that peaked in the 1930s is making its come back. The elegant, glamorous and modern characteristics that shape these décors are influenced by the sleek, polished woods of that period. Most notably, this can be found in the glossy piano finish that is looking to become a mainstay in the industry. Organic Modern: Under the influence of the rapidly growing “green” movement, this style exudes a “forest meets concrete and steel” look. Inspired by nature and raw, unfinished materials, these décors are seen with a satin finish in colors like golden, amber and driftwood. Fun and Spirited: Graphic, modern and bright colors – such as purples, cerise and yellows – are starting to trend in European décor and are beginning to make their way into flooring. Pergo designers believe this movement will really take hold in the commercial sector, as well as give a punch of color to residential children’s and bonus rooms in the future. Although it may cater to a smaller market, this will definitely be a style to watch. Rich Colors: Opposite the aforementioned vivid color trend, rich browns, black and grays also continue to grow in popularity. Recently, gray hues have been found to saturate walls, furnishings and accessories in the latest home décor magazines. Designers expect that this new neutral tone will quickly be integrated into the category of flooring as well. It’s hard to tell which designs will really take off with consumers’ interest this year, but it is clear that there is certainly no shortage of inspiration for a home makeover or weekend DIY project. I felt so fortunate to have had a firsthand peek, and I already look forward to seeing what designers will have in store next year! We are proud that LCWA has once again made the list of O'Dwyer-ranked independent PR firms! We landed at 49 on the overall list. We also remain one of the top six firms in Chicago and top three firms specializing in the home products categroy. Congratulations to our Public Relations Global Network (PRGN) partners who also made the list: Dye, Van Mol & Lawrence, CooperKatz & Co., Ground Floor Media, VPE PR, Landis Communications and Buchanan PR. LCWA is thrilled to add two new clients to our roster! MJSI, Inc. of Shorewood, Ill., is a leader in creating, manufacturing and marketing water-saving toilet products. We are currently launching the company’s HydroRight® product, a dual-flush converter. They have a great story for media, thanks to its ease of installation, affordability and incredible environmental benefits. MJSI is a great complement to our roster of home products clients. We also have started working with Matthews International, a Pittsburgh-based manufacturer and marketer of memorialization products. Matthews is a leader in its industry with a 160-year history and many interesting stories to tell. We welcome MJSI and Matthews International to the LCWA family and look forward to sharing information about our successes in the future! For the past four years, LCWA has been proud to provide PR service to UCAN, a community-based social service organization that focuses on healing trauma, educating children and families, and preventing violence. One in four teens (26%) know someone who has been shot. More than one in three teens (35%) fear being shot someday. One third of teens (34%) said they can get a gun if they really wanted one. Four out of five teens (83%) agree that young people would benefit from more violence-prevention programs. We planned and held a press conference at the UCAN headquarters in Chicago. During the conference, five teens detailed their own experiences with guns and asked adults to take action to help stop the violence. Supporting the teens at the event were U.S. Congressman Michael Quigley and Illinois State Senator Donne Trotter. The press conference generated great coverage in the media, with stories appearing in the Chicago Tribune, WLS-TV (ABC), WGBO-TV (Univision) and WGN-AM. While I love all of the work we do at LCWA, I have to admit that getting attention for UCAN and its great programs to help prevent violence always has a special place in my heart. For more information about the “Teen Gun Survey” results, click here.